"For his outstanding and innovative research on the application of interfacial phenomena to mineral processing, his national and international leadership in defining research needs in mineral processing, and for his tireless service to the entire mineral engineering community as a professional leader and advisor to government and industry." Ponisseril Somasundaran was appointed in 1983 as the first La Von Duddleson Krumb Professor of Mineral Engineering in the Columbia University School of Engineering and Applied Science. He received his M.S. and Ph.D. from the University of California al Berkeley in 1962 and 1964, and his Bachelor of Engineering from the Indian Institute of Science in 1961 and a B.S. from Kerala University in 1958. Before joining Columbia. he worked for the International Minerals and Chemical Corporation and Reynolds Industries. He has been a visiting professor/scientist al the University of Melbourne and the Indian Institute of Science and is the author/editor of seven books and about 170 papers and patents. 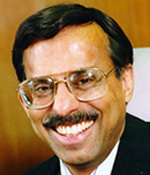 In 1985 Professor Somasundaran was inducted into the National Academy of Engineering. A Distinguished Member of SME, he has received theSME Antoine M. Gaudin Award, Mill Man of Distinction Award and the SM E Publication Board Award. He is the recipient of the "Most distinguished achievement in engineering" award from AINA. Currently Chairman of the Engineering Foundation Conference Committee, he has served on several university research advisory panels; has chaired national and international workshops and symposia; and has lectured internationally. He has served on the SME Board and Executive Committee and on many SME committees. Professor Somasundaran has been a consultant to the National Science Foundation, National Institutes of Health, United Nations, IBM, Exxon, Colgate-Palmolive, Union Carbide, B.F. Goodrich, and Amoco.